Every year, 35 to 40 children across the country die from heat exposure in vehicles? Sadly, these deaths can be prevented. 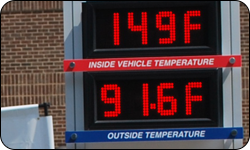 The temperature inside a vehicle can rise to almost 20 degrees in just 10 minutes? In fact, it gets so hot that s'mores can be cooked in the backseat. A child's body heats up 3 to 5 times faster than an adult's? Even a few minutes of heat exposure can be dangerous for a child. With its soaring temperatures, July is historically the deadliest month for child fatalities in hot cars? But hyperthermia can occur even on days with mild 70 degree temperatures. Some of these deaths occur when a parent accidentally forgets a child in a car; some occur when a parent intentionally leaves a child in a vehicle. In other cases, a child was playing in an unattended vehicle when overtaken by heat. That's why you should NEVER leave a child unattended in a car, for any length of time or at any time of year. Never leave a child alone in a vehicle. Check to make sure all children exit the vehicle when you reach your destination. Lock the doors when your vehicle is parked. Teach children that cars are not places to play. Busy parents have a lot on their minds, so give yourself a reminder. Place your purse, briefcase or other important items in the backseat next to your child's car seat to help you remember to look in the back before leaving the car. Set a reminder on your cell phone or other mobile device to remind you to drop off children at school or daycare when routines change. Make an agreement with your child's school or daycare that you will be notified if your child is not dropped off at the normal time. If you see a child or pet left unattended in a vehicle, call 911 immediately.